Behind the Mic—Guest Travis Stone – Welcome to the 2019 Beemie Awards! Travis Stone started his announcing career about 3 weeks after I did back in the spring of 2006 when he took the job at Louisiana Downs. He’s been there ever since and has also called races at tracks like Churchill Downs, Golden Gate Fields, and Calder Race Course. Modern technology is a funny thing, because I’ve never met Travis, yet probably talk to him more than any other announcer I know LOL. 1. We all remember our first race call, what do you remember about yours? 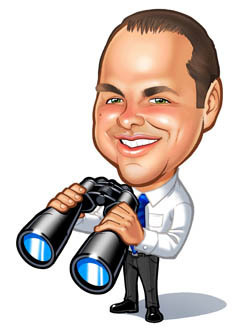 TS: I called my first race live at Suffolk Downs with Larry Collmus standing right next to me. It was a lot of fun but also challenging. I had very little experience calling a race in person at the track – even into a tape recorder – because my “local” track was Saratoga. So I had to become familiar with the “whole experience” in less than two days. I knew right away though I was doing what I wanted to do. 2. One of the coolest days of my life was getting the call and offer for my first announcing job. What do you remember about getting that first job? And had you ever heard of Shreveport La? TS: I remember I was watching Seinfeld re-runs when my now good friend Mark Midland called to offer me the job. I was beyond excited but also a bit nervous about making the cross-country move. I was only three months removed from college so it was all happening very fast. I made it though. It also helped I stopped and spent two weeks at Keeneland on my way down. 3. You grew up close to Saratoga. I’ve never been. Is it as magical as everyone says? What are your best memories from there? TS: Saratoga is horse racing heaven. The entire community and region rallies around and appreciates what is happening. The atmosphere, the grounds, the grandstand, the paddock – everything about Saratoga is special. We went to the races whenever my Dad was off (he would also save his vacation days for Saratoga). I used to walk around and inevitably find myself standing near the finish line watching Tom Durkin. Stalkish? You bet. 4. You were one of the 5 guys invited to audition for the Churchill Downs job in 2009, what was that week like? TS: It was a lot of fun calling for that week at Churchill Downs. There was a lot of pressure as well – a lot to think about. It was only my second year as a full-time announcer so I was still developing my style and finding what I felt worked. My calls then were a lot different than my calls now. Random memory from that week: The microphone wrapped around your ear and was really small. I remember being worried that it had fallen off – you barely felt that it was there. 5. Most of us are bettors, tell me about one of your best scores as a punter? TS: I don’t have any gigantic racing scores as I don’t play the Pick Six or bets where five or more digit payoffs are common. My best scores as a horseplayer have centered around my favorite wagering strategy – keying longshot closers underneath in the Trifecta and Superfecta. Horses like Golden Soul in last year’s Kentucky Derby. 6. What are some of your favorite tracks/circuits to play? TS: I don’t really focus on or avoid tracks in particular. In fact, I prefer tracks with smaller pools as they tend to be more inefficient. There are a few though where I never seem to be right. Fair Grounds, despite having a lot of the horses I see during the summer, is a track I struggle with. I’m not sure all of the riders there know how important it is to save ground. 7. The days of being just an announcer are kind of gone, what other jobs do you do at Louisiana Downs? TS: I’m both the track announcer and Mutuel Manager here at Louisiana Downs. I’m also involved in the day-to-day operations of the racing department. The other day I was drafting-up a proposed stakes schedule for our upcoming meet. Yesterday I was working on optimizing our mutuel teller schedule because Sunday’s have been busier than usual. My favorite part of the job? When I get to head upstairs and call races. 8. You’ve always had a good presence online and in social media, do you think the internet can be used in any different or better ways to help racing? TS: I actually believe racing has done an okay job in terms of moving into social media and other channels. The challenge is people thinking that just because you create a Twitter account and tweet once in a while that suddenly you’ll be successful. It doesn’t matter how awesome your tweets or status updates are. If your product stinks, people won’t care what you have to say. 9. What’s the booth at Louisiana Downs like? Shape, windows, sight lines, does the air conditioning work etc. TS: The booth is on the 6th floor. It’s spacious with fantastic views. There are some support beams blocking the stretch, but you barely notice them once you get used to them. It also has its own air conditioning unit which is critical as the booth is basically a tin can on the roof that is 100% exposed to the sun when it’s 110-degrees outside. 10. Ever had any strange or eccentric guests in the booth with you? TS: For last year’s Super Derby someone brought-up a group of highly intoxicated ladies to the booth along with one sober male. As you know, when it comes to the big races, you like to be alone or with close friends. I was stuck though and was not only concerned about calling the race but also them making noise during the call. They were loud right up until the gates opened. Afterward, the guy even admitted being worried they wouldn’t be able to keep quiet. Next year, I’m locking the door. I’m glad they had fun though. I’m sure the picture of us is on someone’s Facebook page out there. 11. Almost all of us have a memory of Luke Krutybosch, what’s your best memory of Big Luke? TS: I remember emailing Luke a video of a race call I did looking for feedback. 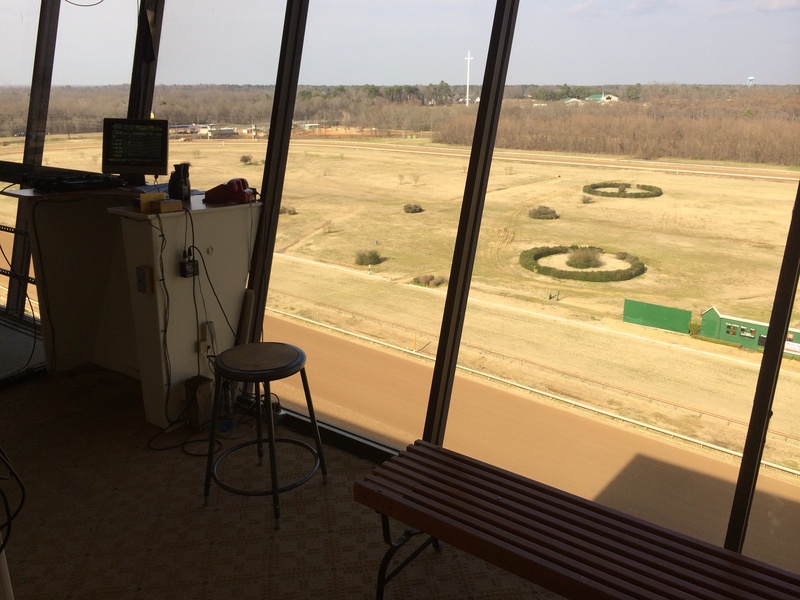 With no racetracks to visit for practicing, I was stuck having to call races off the TV. I don’t think he believed my call was legit (as in I knew the results ahead of time or cheated and re-did the video), but he offered to get me a gig or two in the southwest. He was such a smooth race caller – everything rolled off his tongue so easily. His voice is definitely missed in horse racing. 12. If you had a “Call Any Race You Want” card in 2014, which race would you cash it in with? TS: I would put the first ever $5,000 non-winners of two lifetime New York-bred claimer at Saratoga as my choice if it meant calling a race there. Saratoga is the reason why I fell in love with this great sport. Even if I decided to do something different in this industry, it would all be because of my time spent at the Spa. If ever I decide to pursue something else in life, I will still probably find my way back there for the season, even if as just a fan.